beauáty [byootee] (plural beauáties) noun 1. pleasing and impressive qualities of something: the combination of qualities that make something pleasing and impressive to look at, listen to, touch, smell, or taste 2. pleasing personal appearance: personal physical attractiveness, especially with regard to the use of cosmetics and other methods of enhancing it 3. beautiful woman: a beautiful woman or girl her reputation as a great beauty 4. fine example: something very good, attractive, or impressive of its kind That long pass was a beauty. 5. excellent aspect: an attractive, useful, or satisfying feature one of the beauties of working from home [13th century. 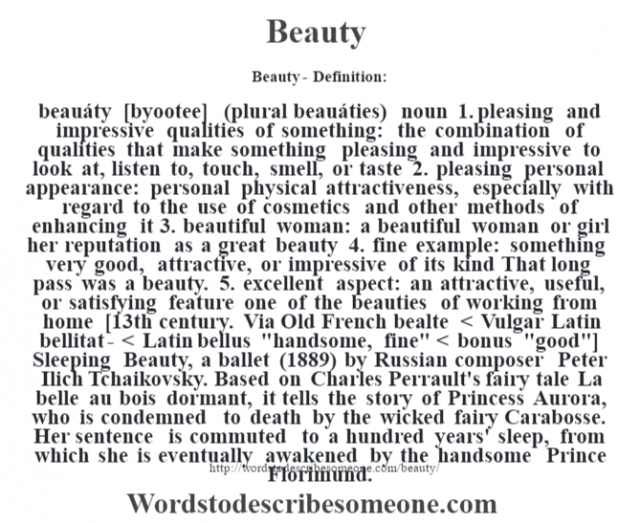 Via Old French bealte < Vulgar Latin bellitat- < Latin bellus "handsome, fine" < bonus "good"] Sleeping Beauty, a ballet (1889) by Russian composer Peter Ilich Tchaikovsky. Based on Charles Perrault's fairy tale La belle au bois dormant, it tells the story of Princess Aurora, who is condemned to death by the wicked fairy Carabosse. Her sentence is commuted to a hundred years' sleep, from which she is eventually awakened by the handsome Prince Florimund.